When you're talking about a horse's frog, you are talking about a part of his hoof, rather than a small, green amphibian. The frog is located on the sole of the foot, and while there are several theories as to how it got its name, it does serve a useful and very functional purpose for your horse. When you pick up your horse's foot, you will see the frog in the center of the underside of the hoof. It has a wide base that starts at the heel and tapers down into a point down towards the toe. It is shaped like a "V" in the middle of your horse's foot. One theory about how the frog was named is that it physically bears a resemblance to a frog in its appearance and texture. The frog serves as a cushion for the foot. It provides padding when the horse steps down and helps distribute weight across the foot. 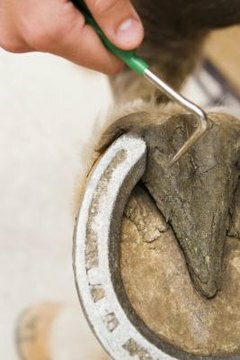 The frog protects the more sensitive internal structures of the hoof from being damaged during movement or when the horse steps on various objects, such as rocks. Gravity causes horses blood circulation to slow in the lower legs, which contributes to the swelling of the legs of horses who are kept in stalls for prolonged periods of time. The frog works to improve circulation by compressing the veins and squeezing blood back up into the veins when the horse steps down. The frog functions as a pump to keep blood moving through the limbs. Because the frog is weight bearing, it is in contact with the ground when your horse walks. The shape of the frog and its soft yet tough texture enable it to provide additional traction and help prevent your horse from slipping. Barefoot horses, those without shoes, use the frog more for traction than those with shoes do. Your Horse: Why Does a Horse Have a Frog, and Is The Shape Important?